1. AC3-75 66 - 88 MHz. 2.5 MHz. 3 dBi. 2. AC3-150 134 - 174 MHz 8 MHz. 3 dBi. 4. AC9-150 136 - 174 MHz. 6 MHz 9 dBi. 5. AC6-350 300 - 400 MHz. 20 MHz. 6 dBi. 6. AC9-350 300 - 400 MHz. 20 MHz. 9 dBi. 7. AC6-450 406 - 512 MHz. 25 MHz. 6 dBi. 8. AC9-450 406 - 512 MHz. 25 MHz. 9 dBi. 9. AC9-850 800 - 990 MHz. 90 MHz. 9 dBi. 10. AC9-1450 1300 - 1600 MHz. 110 MHz. 9 dBi. 11. AC9-1850 1700 - 1990 MHz. 160 MHz. 9 dBi. 12. AC12-250 220-290 MHz 12 MHz 12 dBi. 13. AC6-250 220-290 MHz 14 MHz 6 dBd. 14. AC10-2450 2300 - 2600 MHz. 200 MHz. 10 dBi. 15. AC12-350 300 - 400 MHz. 15 MHz. 12 dBi. 16. AC12-450 406 - 512 MHz. 20 MHz. 12 dBi. 17. AC9-550 512-608 MHz. Entire Band 9 dBi. 19. AC9-650 614-698 MHz Entire Band 9 dBi. 20. AC8-725HP 700-750 MHz 50 MHz. 8.5 dBi. 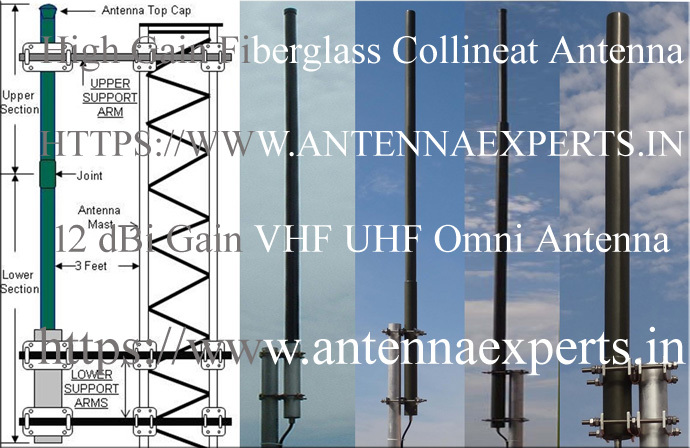 Antenna Experts specialized in designing and manufacturing of Vertical polarized fiber glass collinear antenna with variety of omni-directional gain which start from unity to 12dBi omni gain with frequency range start from 30MHz to 6000MHz. Our AC12 series fiberglass collinear antennas are super high gain omni antenna with 10dBd. gain (12dBi) and are highly suitable for base station antenna and repeater station antenna where large bandwidth is required without having the requirement of multiple antennas. The AC series Omnidirectional Fibreglass Collinear Antennas are rugged all weather models, sealed in a fiberglass tube, having excellent transparency for RF signals and enough strength to withstand specified wind loads. In put termination of Fiberglass Collinear Antennas is located inside the base of aluminum mounting section for weather protection. AC series Fiberglass Omnidirectional Collinear Antennas have excellent horizontal omnidirectional radiation pattern with constant gain over 360 degrees over complete horizontal plane. A range of heavy-duty Fiberglass Collinear Antenna with high gain to super high gain omni antenna are designed for use in communication networks. High gain fiber glass collinear antennas in this range are carefully designed to minimize low passive inter-modulation products to help reduce network interference. These omni-directional high gain collinear antennas are housed inside a high-strength fiberglass enclosure and manufactured to the highest quality standard ensuring long term reliable operation. All of our fiber glass collinear antennas are marine variant. These collinear antennas are housed either in fiber glass radome or in ABS radome. Both are extremely rigid and highly transparent to the RF signals. The radiating elements of marine collinear antennas are made of high quality brass. Support pipe is made of 6063T6 ultra corrosion resistant architectural anodized aluminum alloy. Mounting hardware is made of type 316 marine grade stainless steel. All these features make these antennas highly suitable for marine environment. Antenna Experts manufacture Fiberglass Collinear Antennas for 66-88 MHz, 134-174MHz, 300-400 MHz, 406-512 MHz, 600-700 MHz, 800/900 MHz, 1427-1535MHz, 1800/1900MHz, 2400MHz, 3500MHz and 5100-5800MHz frequency bands with 3 dBi, 6 dBi, 9 dBi and 12 dBi (10dBd. Gain) omni directional gain. The fiberglass collinear antenna consist of large diameter brass radiating elements stacked vertically, fed in phase and enclosed in fiber glass tube. The antenna termination is enclosed at bottom of the antenna for complete weather protection. The stainless steel mounting hardware is supplied with the antenna. All our AC series omni antennas are marine variant. These antennas are housed either in fiber glass radome or in ABS radome. Both are extremely rigid and highly transparent to the RF signals. The radiating elements of fiberglass marine band collinear antennas are made of Brass and phasing systems are of Copper. Support pipe of fiberglass collinear antennas is made of 6063T6 ultra corrosion resistant architectural anodized aluminum alloy. Mounting hardware fiberglass collinear antenna is made of type 316 marine grade stainless steel. All these features make our fiber glass collinear antennas highly suitable for marine environment. Fibreglass Collinear antenna radome of 45 mm are made of an exceptionally stiff fiberglass tube, which results in a maximum tip deflection of 3° with a 3 m long tube at wind velocities up to 180 km/h. Our fiber glass collinear antennas uses multiple vertical radiating elements, stacked vertically, fed in-phase to increase the gain of omni antennas.